A leading UK precision plastic moulder has installed a new Kawasaki robot to aid production – and, unusually, has chosen to install and commission the unit itself, rather than follow the traditional path of having either an integrator or the robot supplier do it for them. Based in Malvern, Worcestershire, SynthoTec Ltd is one of Europe’s premier producers of injection-moulded ultra-high precision components. The company has recently installed a Kawasaki RS20N robot, which has allowed it to boost production, cut costs and achieve a significant reduction in waste material in one of its most important manufacturing processes. SynthoTec has been making precision parts from plastic for almost 30 years, and its bearing cage products are used extensively in two broad application areas. Heavier duty rotating mechanical and electrical applications, such as alternators, air conditioning units, motor vehicles, HGV axles and railway locomotives, form a major part of the business. Additionally, lighter weight, yet equally durable, precision moulded plastic parts are also produced, and these find their way into an equally wide range of lighter-duty products, such as child seats, security buckles and power tools. Numbered amongst SynthoTec’s key customers are internationally renowned global manufacturers of rotating and linear bearings, and to these brand names, including SKF and NSK, the Malvern moulder has become the preferred – and only – supplier of the plastic cages that form such an important part of durable, reliable and friction-free bearings. Because the bearings are used in so many applications across both industry and consumer products, the precision plastic cages in which they run must necessarily be manufactured in a wide range of diameters. So, SynthoTec supplies these precision-moulded cages in sizes ranging from as little as 20mm in diameter up to a substantial 250mm, but the company also has the in-house capability to design and produce custom cages (or other special products) of even greater diameter, where required. 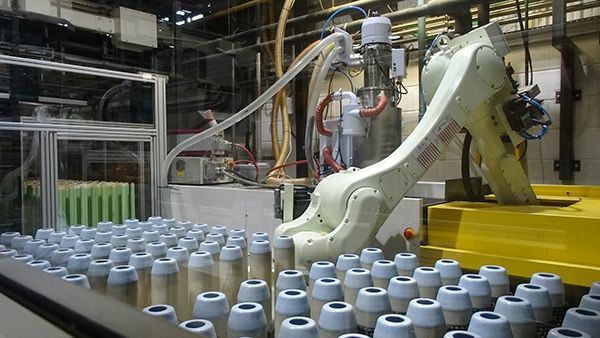 Already a substantial investor in state-of-the-art mould tooling, software and moulding machinery, in the early part of 2018 the SynthoTec management team, led by Managing Director Graham Ward, actioned a desire to further automate and install a new robot in the company’s bearing cage demoulding cells. “We targeted a new robot, as we wanted to move the production cell forward to a new concept, and a 6-axis robot enabled us to greatly simplify the cell,” says Graham. In this part of the production cycle, the company wanted a robot to take the cages from the mould, retain them while the waste sprue was dropped into a recycling granulator and then place the finished cages onto pallet-mounted mandrels, all in one swift operation. Each individual mandrel needs to be stacked with up to 185 completed cages, and the robot would need to ‘feed’ more than 150 close-packed mandrels in succession on each pallet. With thousands of moulding and demoulding operations taking place on each shift, repeatability, reliability and durability were critical elements in the justification matrix, and SynthoTec calculated that the payback period for all three Kawasaki robots in this application would be just 14 months. Jon Hart adds: “Working with Kawasaki Robotics on this project hasn’t just allowed us to achieve every one of our objectives: it has also allowed us to future-proof our systems, too. The Kawasaki system can be easily expanded on, which means that, as we grow, our robot capability also grows for some time to come and we can do it ourselves on demand.” Kawasaki Robotics would expect a lifespan of at least ten years for each unit, subject to no more than routine maintenance. 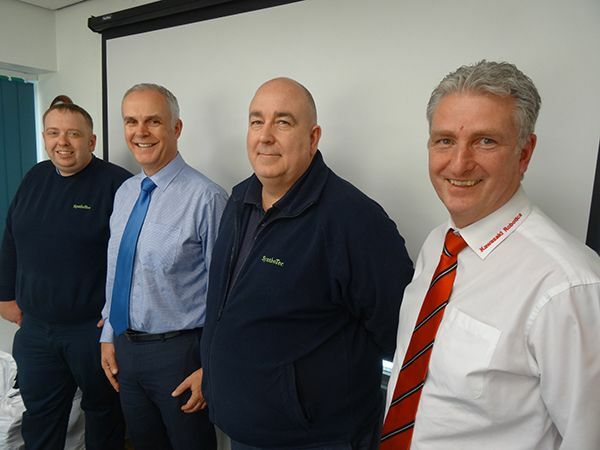 Kawasaki Robotics Sales Manager Ian Hensman, a 27-year veteran of the applied robotics business, further comments: “SynthoTec were clear from the start about both their application objectives and their desire to manage the project to completion themselves. It was immediately obvious to us that, in this case, we could be completely confident in their ability to commission and install one of our robots, with our team simply providing the equipment, together with oversight and detailed infill, as and when required. It is unusual for a customer to want to do this themselves, as our many integrators will confirm. The Kawasaki RS-20N is a medium-duty robot with a 20kg payload, a horizontal reach of 1,725mm and a vertical lifting capability of 3,078mm. Even though it is regarded as a high-speed machine (for example, the wrist can twist at 610°/sec), the robot still achieves a repeatable accuracy of +/- 0.05mm at maximum lift/reach. In point of fact, in the SynthoTec application, it has proved to be working to a tolerance of just 0.02mm over thousands of daily cycles. Brushless AC servomotors are used throughout, and the RS-20N is ideal for operation in environments where good IP ratings are essential – for example, as in this instance, within the plastics industry. The robot’s wrist is certified to IP67, with the arm to IP65, and the unit offers added versatility, with options of either floor or wall mounting as standard.